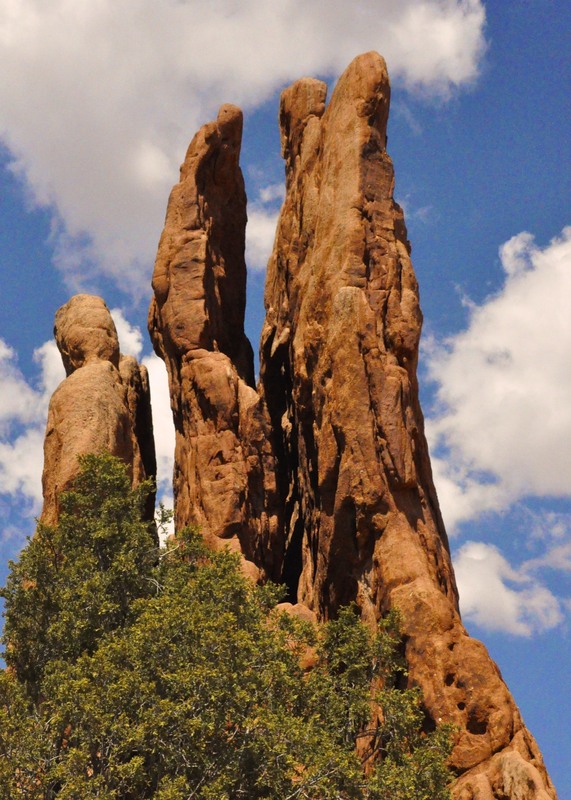 When I moved to Colorado Springs, the first ‘touristy’ thing I did was visit Garden of the Gods. 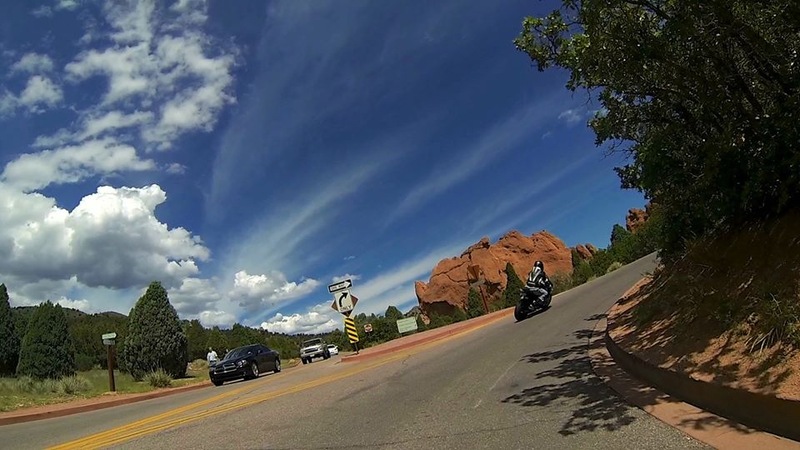 Despite all the other super cool things about Colorado Springs (Pikes Peak, Cheyenne Mountain, The Stargate, The Olympic Training Center), Garden of the Gods is perhaps one of the most popular attractions in the area. 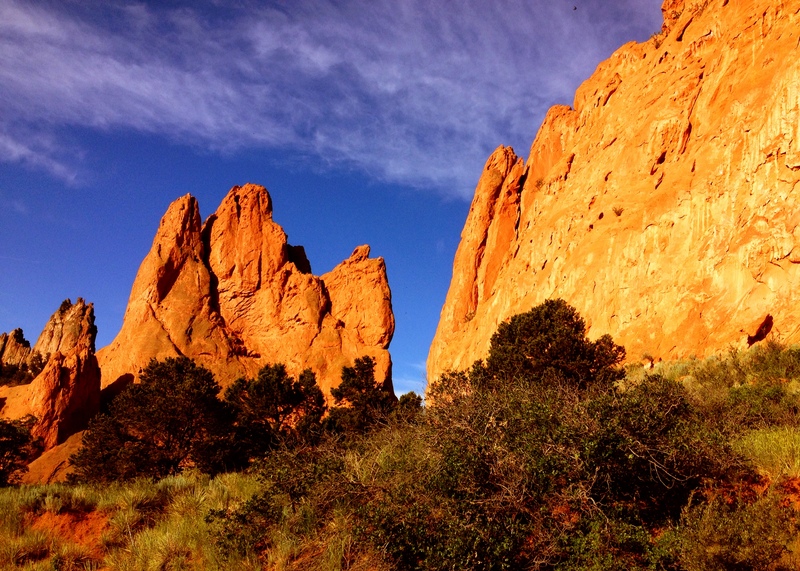 Even TripAdvisor rates it #1 of 140 things to do in Colorado Springs! So, here’s the story: Garden of the Gods was formed millions of years ago due to some crazy upward activity around a fault line. 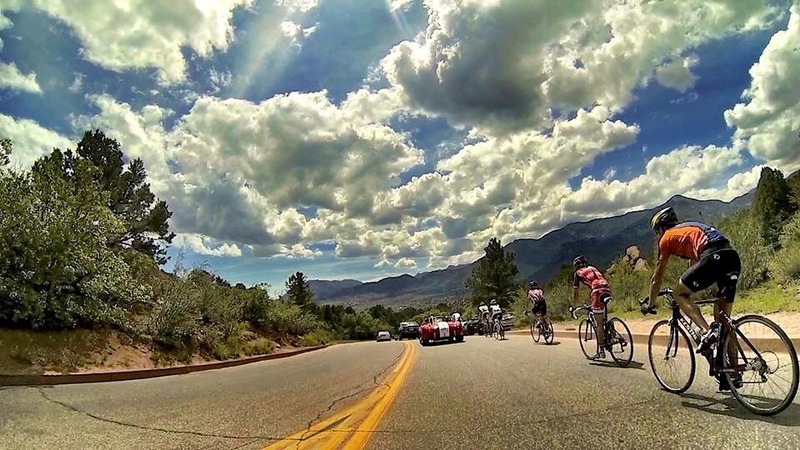 Today, massive red rocks jut out of the landscape as if they either landed there from outer space or pushed their way through the earth like large, solid rock daisies. 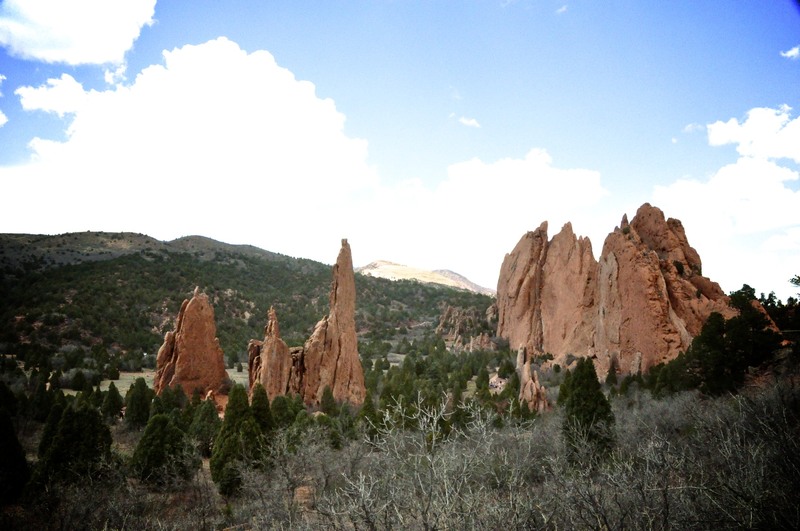 The name Garden of the Gods was given back in the mid 1800’s by two surveyors who, while discussing how the land would make an ideal beer garden, proclaimed that it would be a garden fit for a God. Later, railroad tycoon, Charles Elliot Perkins purchased the land surrounding the features in 1879 to build a summer home. When he died, his heirs handed the land over to the City of Colorado Springs with the caveat that it always remain open and free for the public to enjoy. Pictures do not do this place justice. There is a silence uncanny to urban areas. Birds have made their homes in the outcropping of rocks. People walk through the park daily, alone with their thoughts, or amazed by the beauty, or sharing this treasure with family and friends. I had no idea this existed and it looks absolutely beautiful! It is a special place to visit indeed! I just found you through the A-Z challenge, and I’m loving your posts! Garden of the Gods has been on my list for a while, but I never seem to make it much past Denver when I visit Colorado. 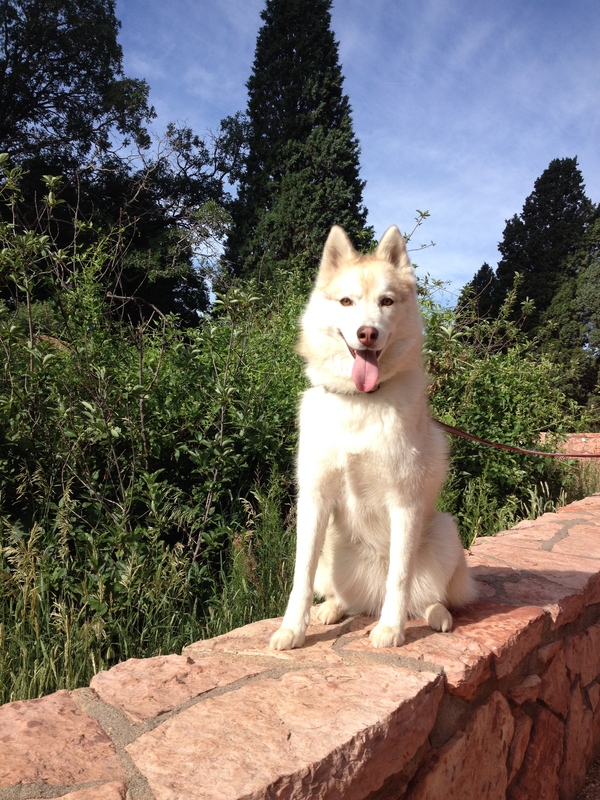 I want to get to Colorado Springs some time…and soon! So pretty! I’ve only lived here for a few years and I never get sick of seeing Pikes Peak follow me on the way to work each morning. I hope you make it here soon! I’ve enjoyed every minute I’ve ever spent in the beautiful state of Colorado, so I have no doubt Colorado Springs is just as lovely. You live in an amazing state! Colorado is beautiful. Only been there once and really need to visit again. Your pictures are colourful and full of life. Thanks for the enlightenment.